First off, you might think I would be writing a post about Little 2 feeling nervous about starting primary school, but you would be wrong. Little 2 can not wait to start school, she is excited and a little bit nervous but she is taking it all in her stride. She has been a bit emotional at home and this could be a bit of anxiety welling up, but it could also just be because she is very tired right now. There has been lots going on for her with a pre-school leavers service, a pre-school trip, and story sessions in Reception as well as a few busy weekends lately. So no wonder the poor girl is tired she needs the holidays. On the whole Little 2 is desperate to start school and keeps asking if it is this week she starts in Red class. She keeps peeping at her pinafores lined up in the wardrobe and desperately wants to buy her first pair of school shoes but we will wait a few weeks for that. She is super excited to have a caterpillar on her peg and drawer and will show anyone who comes to visit her 'starting Reception' booklet the school gave her telling her who's who and what she needs to bring. So no worries about her starting school right now. It was however Little 1 that has had the wobbles about school recently. I thought being a sensitive soul she might be a little apprehensive about changing teachers as she was last year and again when her teacher left at Christmas. But I have to be honest and admit the extent of her worries took me quite by surprise. 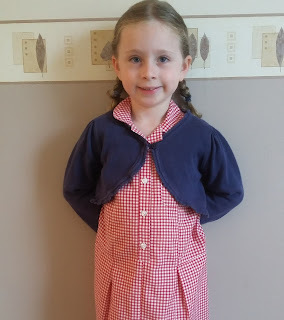 Little 1 adores school and has done since the very start, she settled into reception really quickly, despite all her pre-school friends being put in a different class, and took to learning like a duck to water. She has excelled at reading, she loves to write and has bits of paper, stories and registers all over the house, I have had to buy her some folders to keep all of them in. For her birthday all she wants is a desk and lots of folders, pens and notepads and desk accessories so she can do more writing and drawing. She has always been happy going to school and is popular and confident there with lots of good friends, at home she is a little more needy and sensitive but at school none of this shows as she bounces out smiling everyday telling me what she has been up to. One night a few days ago she had gone to bed as usual, she often chats to herself for a while before falling asleep, and I was downstairs and thought I heard her crying so went to check on her. I found her quietly sobbing and it broke my heart to find her in bed unhappy, I got in with her and asked her what was wrong. First she told me a few little things that I knew weren't really what was bothering her but we chatted about them and then I asked her what was really bothering her and the floodgates opened. It was horrible to hear my girl crying so hard and it was several minutes before she was able to tell me what was wrong. She was worried about moving up to year 2. I held her and we chatted as she told me her fears, she was scared that the Year 2 children are so big and she wouldn't know any of the children in Reception. She was worried that she wouldn't see her sister at playtime as lunchtimes are staggered due to space in the dining hall, that year 2 have a different playground to reception and year 1 and she wanted to be there if her sister fell over or needed a cuddle. She was worried as she didn't know much about her new teacher and who the classroom assistant was and that she would miss her old teacher. How long had she had been worrying about these things and how could I make her feel better? I felt so sad that Little 1 was feeling this way. For nearly an hour we talked as she sobbed and I attempted to allay her fears. 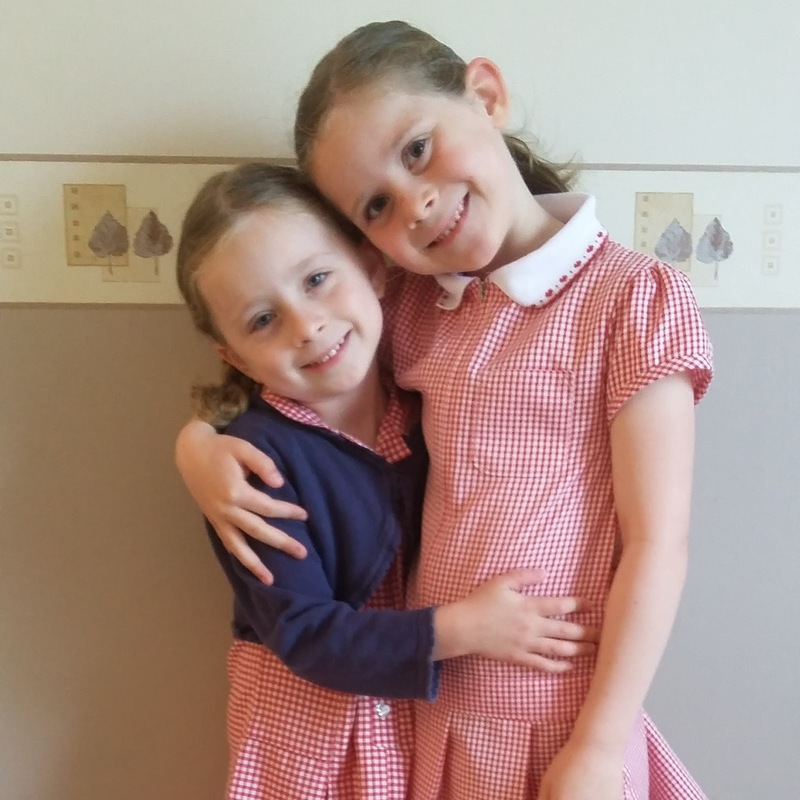 As her school is an infant school year 2 are the eldest, I told her that she would be one of the oldest ones next year and had to promise her that she wasn't going to grow extraordinarily huge over the summer (some of year 2 are seriously tall all of a sudden). I reassured her whole class was moving together, her friends etc and that the Reception children would be new and unsure too. I told her to ask a dinner lady if she could cross the playground to see her sister and that she would see her in assembly and other places, I told her that her teacher is lovely (She has taught friend's children) and that she will get to know her teaching assistant as well as see her old teacher around the school. She went to sleep feeling worried but better and I sat and felt unsettled that my little girl was unhappy. The following morning I had a quick word with her teacher who offered to take Little 1 to her new class at break time to meet her teacher and have a chat. When Little 1 came out of school she felt better but was still rather worried. The following day was moving up day where all children went to their new class for an hour and after school parents could go and meet the teacher and see the classroom. 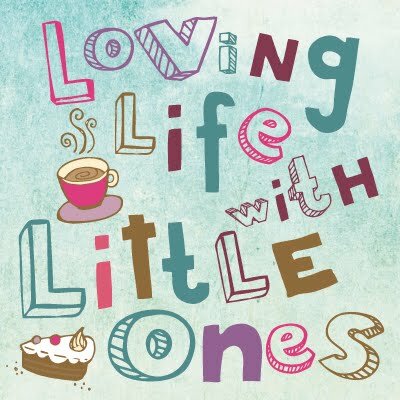 Little 1 was biting her nails as she stood akwardly in the classroom waiting for me to say hello to her teacher but after a good look around and a quick chat she seemed happy and there have since been no more tears and when I asked she said she felt happier. Hopefully she will not be too nervous come the end of the school holidays but that we will have to wait and see. God help us next year when she has to move up to juniors, that is a whole new school!